Ammunition is a product advertised and sold as pheromone cologne to help men get closer to more women, more often. The marketing campaign surrounding this product does seem to have resulted in a few men giving this product a try. The customer reviews of Ammunition are few and far between, and they have been mixed at best. More customers that have tried this product need to do a review, before we’ll get a better idea of the effectiveness of this product. Considering this product seems to be decreasing in popularity, we might never get enough customer reviews to make an informed decision concerning this product. Ammunition hasn’t gathered a big following of men that believe this product can help them attract more women. This isn’t surprising considering the lack of even average reviews on this product, the price and the number of men giving this product a try. 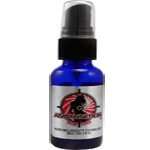 We think Ammunition is probably just another product claiming to be pheromone cologne that has failed to live up to customer expectations of a product that works. It is very strong and lasts a long time. It smells like raw testosterone and strong fragrances. I personally don’t like it all. It would be good to wear to the gym, although, I can’t imagine how any girls could be attracted to it.